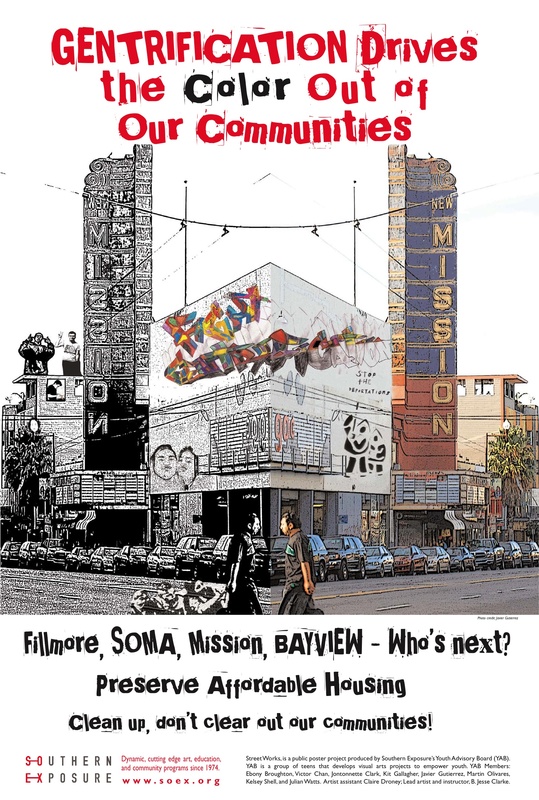 Fillmore, Soma, Mission Byview--whose next? Clarke is the founding editor of Freedom Voices Press, artistic director of Encounters in the Americas/ Encuentros de los Americas project of CENSA and editor of Race, Poverty & the Environment a journal of social and environmental justice published by Urban Habitat. He is the co-editor with Roger Burbach of September 11 and the U.S. War, Beyond the Curtain of Smoke co-published by Freedom Voices and City Lights publishers 2002; editor of Image and Imagination, Encounters with the Photography of Dorothea Lange, 1997; and co-editor, with Clifton Ross of Voice of Fire, 1994, the first anthology of Zapatista communiqués and interviews published in English. From 1998-2004, Clarke was editor of MediaFile a bi-monthly journal of media analysis and resources for activists published by San Francisco's Media Alliance. A California Arts Council artist-in-residence 1999-2001 and a San Francisco Arts Commission lead artist on a project called Raising Our Voices, Clarke has been teaching writing, digital design and critical thinking in community settings for over a decade.